It was a sad day for residents of Marchmont as Warrender park Post-office lost its fight against closure today. It is one of the 2500 post-offices closed across Britain as part of the latest batch of closures ordered by the incumbent Labour government. In the Marchmont area where Warrender park is located the news was met with a feeling of sadness and indeed bitterness from many within the community. Local Liberal Democrat MSP Mike Pringle had come under fire by dozens of angry and upset residents who had been in touch with Edinburgh South Lib Dem team to protest. But the council had been told by Royal Mail and Postwatch that there is no official appeal process and the Labour MP does not have any special powers over the decision of Royal Mail to close Marchmont’s Post Office. Despite massive support for keeping the branch open it was eventually decided to go ahead with the closure. As with the war Iraq and other unpopular government actions, wide spread opposition to the closures has had little if no effect on policy. Senior Liberal Democrat MPs, Peers, councillors and candidates presented a petition to Downing Street protesting against the closure of Britain’s post offices. The deputation delivered 50,000 signatures hundreds of which came from Edinburgh South. Also, cutting across party lines, there has been general bad feeling about the loss of an institution which is intimate with the community and a practical, and perhaps essential amenity for many elderly people who can not easily get to branches that are further away. The putting out of the elderly, but more generally any user of the Post Office in their own vicinity was the thing that was most remarked upon by those who spoke to Dunedin Napier News. Warrender Park Post Office is gone but one feels the fight will continue to save our communities and our postal service. 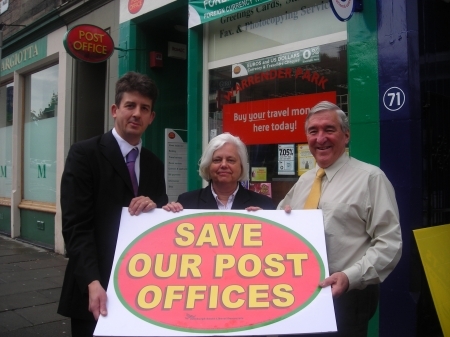 Posted in Politics and tagged post office closure edinburgh warrender, royal mail, Sub-Postmasters Mr and Mrs Smalley say goodbye. Bookmark the permalink.